The gate’s ajar. Let’s go down the stairs. 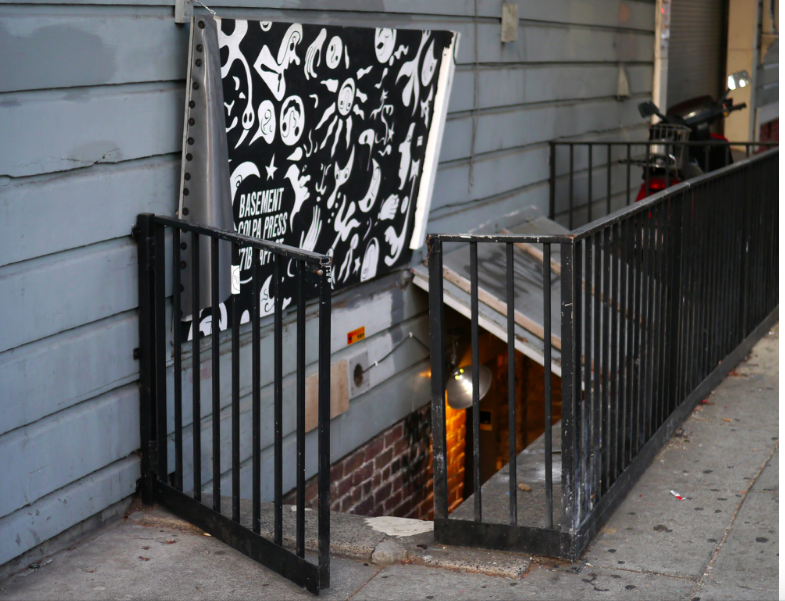 Even if you’re looking at the ground while you walk — not a terrible idea here in the Mission — you’re probably not going to see it. Somehow, a black-and-white sign as striking as dazzle camouflage and a flight of stairs descending into a compact underground vault goes unnoticed, unless you’re specifically looking for it. And then you can’t not see it. Well, good. That’s the idea. What you’ll discover if you wander down these steps is a space so esoteric it’s hard to imagine you haven’t transported yourself many miles from the heart of the Mission to a realm of cheap rent, working artists, and blue-collar printers — or somehow traveled backwards in time when these things could be found here. 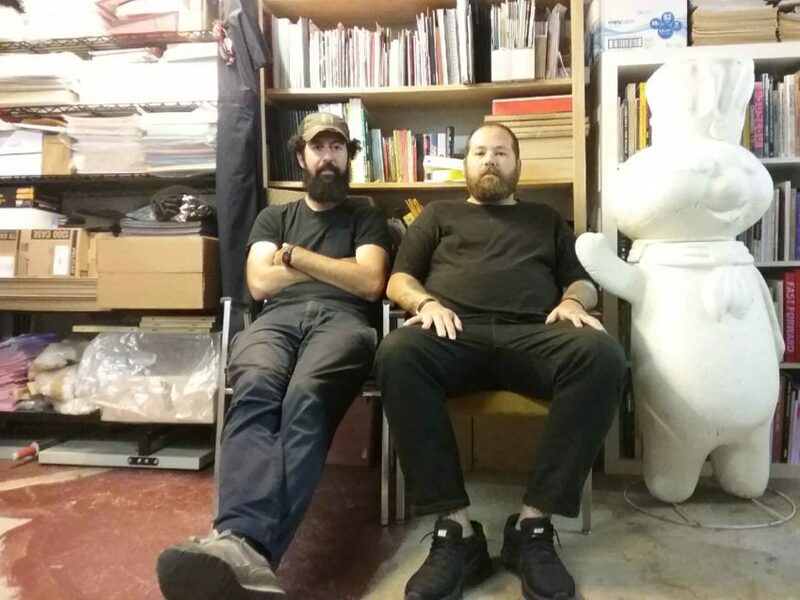 Kasprzak and Antonucci are the proprietors of Colpa, a design shop (they did branding work for Trick Dog and Al’s Place) and book and poster printer (the San Francisco Art Book Fair, which Kasprzak and Antonucci co-founded, will run Friday to Sunday). This 1,000-square foot space is also a collective studio for up to eight artists at a time — and it’s the repository of more than 3,000 VHS tapes, which have been deposited here by well-wishers like coins in a fountain. A few meters away from Kasprzak and Antonucci’s workstations, intern Louise Chevallet uses Wite-Out to conceal blemishes in posters created by the risograph printer, which she subsequently hand-numbers (1/100, 2/100, and so on). The risograph itself rests in a well-lit corner and takes up about as much space as a dishwasher. It hails from 1991, and it’s still here. Prior inhabitants of this basement melted a necktie and adhered it to the front door. Nobody knows why. It’s still here too. Luca Antonucci, left, and David Kasprzak are artists who know the value of not being seen. Photo by Joe Eskenazi. Carlos Gonzalez was born in the Mission in 1959 in an era when it was a newly minted Latino neighborhood. This was a realm of mom-n-pop shops; nobody had to coin terms like “neighborhood-serving business” because every business was a neighborhood-serving business. What else could there be? Everything was small and local and specific to its neighborhood — everything. “Every neighborhood had its own clique,” recalls Gonzalez. “Back then we didn’t call them gangs. But we behaved like gangs: Dolores Park was known as the Bridge Boys. Precita Park. The Folsom Park Locos.” The latter was Gonzalez’s clique. The young Folsom Park Loco became a muralist — which he still is — and spent 25 years as a juvenile probation officer. He knew the terrain. He knew what was going on on the streets, in the buildings and, of course, underground. And then the terrain changed. 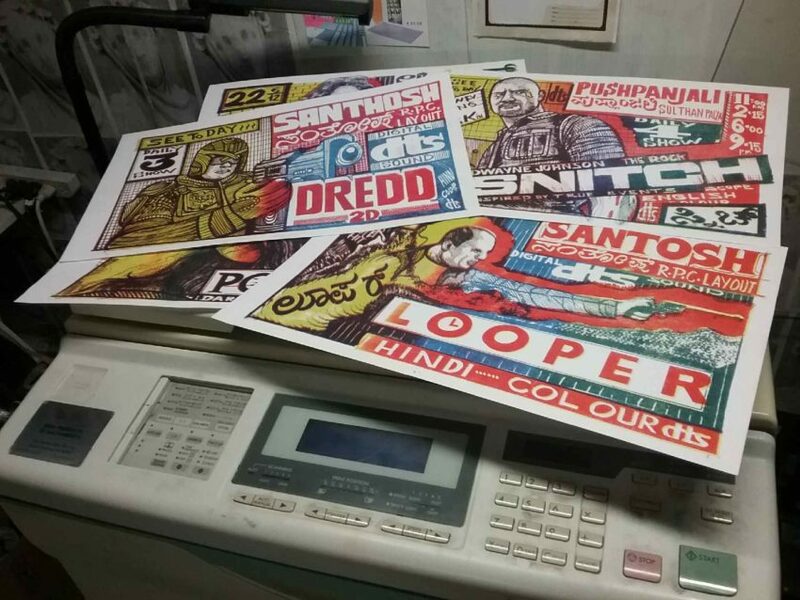 These movie advertisements from Bangalore, seen here atop the risograph printer, will be featured in a forthcoming book from Colpa Press called See To Day. Photo by Joe Eskenazi. Spaces, says Jesse Drew, “would come and go.” A goodly percentage of the storefronts on Valencia were vacant, “and all of them had basements.” There’d be literal trap doors into the underground, dudes selling beer, punk music, and no overpriced real estate or Ghost Ship-like tragedies to bring about anyone who’d stop the music. There was the “Gartland Pit,” a hotel that burned in 1975, killing 14, and was left vacant for years. “People did shows there all the time,” recalls Drew, a labor organizer-turned-artist who arrived in the Mission as a teenage runaway in 1971. “It was everything from graffiti exhibitions to musical performances.” There were punk shows at The Farm, at Army and Potrero Streets, “the most violent nightclub of the ‘80s,” which was within shrapnel distance of Survival Research Laboratories, which specializes in robotics, pyrotechnics and flames. 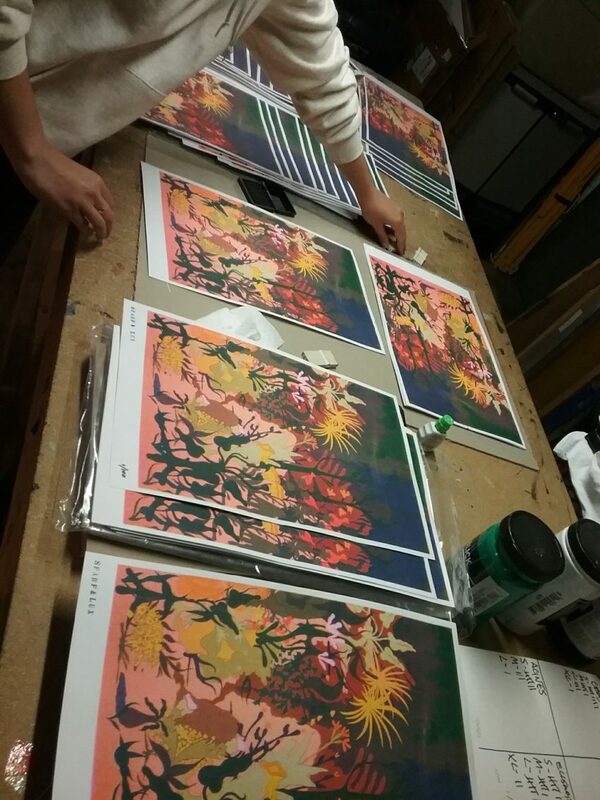 Louise Chevallet puts the finishing touches on posters printed up on the risograph. Photo by Joe Eskenazi. Well, that’s gone. Kasprzak and Antonucci are thrilled to have a basement hideout that floods when it rains; they work a number of ancillary jobs to keep rent paid, including branding work and teaching gigs. Money made elsewhere gets reinvested here — and at a three-month-old bookstore at 716 Sacramento Street for their own publications and works from small presses that don’t usually distribute. The bookstore is new enough that, on Google Street View, you can actually see Kasprzak and Antonucci through the front window, unpacking boxes and setting the place up. Echoing Drew, he notes that San Francisco became a magnet for creative types because “this place was weird and experimental, and you could afford to take a risk and fail here.” But now you can’t afford to do much. Things change. But this thing hasn’t: There’s a world going on underground. 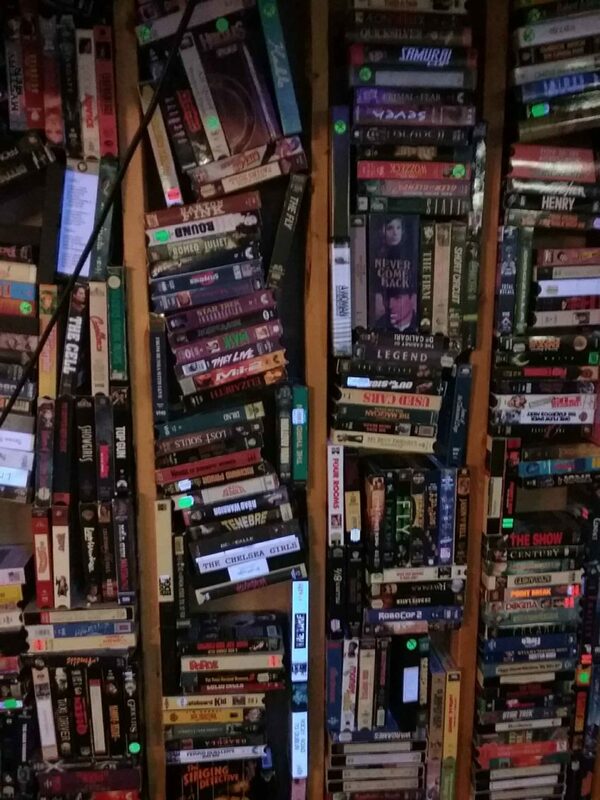 That’s a lot of VHS tapes, yes. Photo by Joe Eskenazi.